Been working on this, on and off, for quite awhile. It's the first monster ship I ever tried to build. is more advanced than the Colonies, so the weapons are slightly different. Now, some advice from those who HAVE built monster ships like these, or the Star Destroyers of Star Wars fame. Like - komaro on March 11, 2019. What program are you using for an unwrapper? First of all, that looks really nice Looks really clean. As for the textures, for starters, that UV is very loosely packed. You can definitely fit more pieces there. And then, how much detail you want out of those textures? If the texture is 2048x2048, you can't fit much more. But if you are working with 4096, you can make those pieces smaller and fit more in. At the same time, nothing wrong with multiple maps. Unless this is for a game engine. Then you need to do as few textures as possible. VERY nice... some impressive detailing. 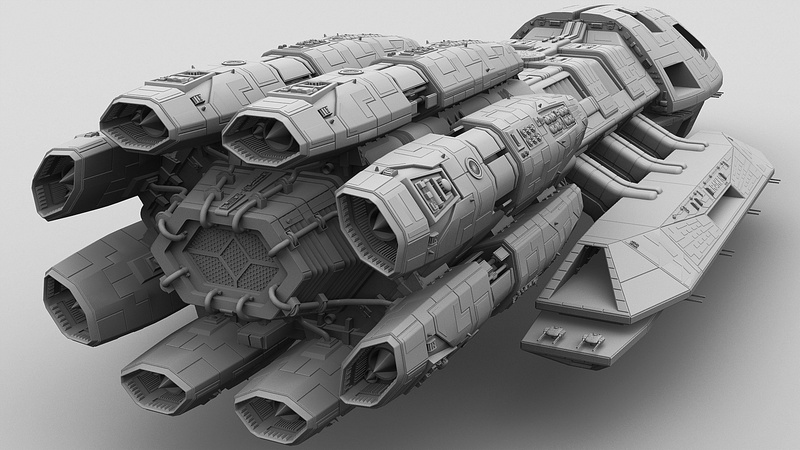 For the details, like Viper said, more and bigger textures with your UV islands closer together. What I also do with large models for a game engine (I make cargo and navy ships for virtual training), is to add a 2nd or 3rd tiling texture on another UV set to give you that extra detail when going close in with the camera. 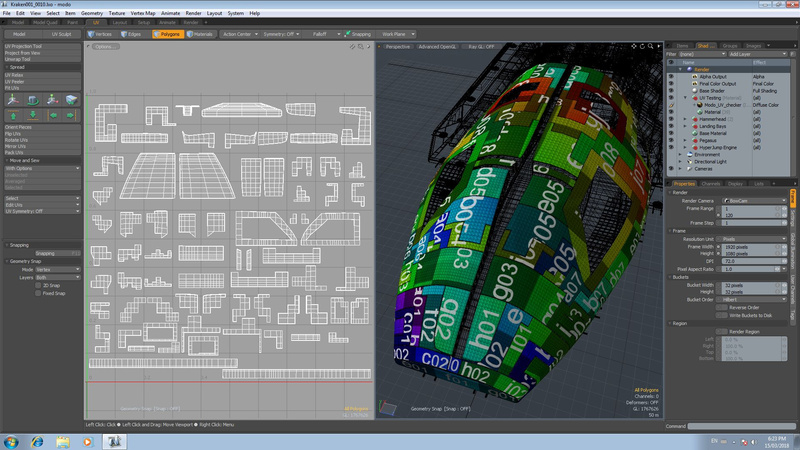 Firstly, Lizzy's question, Modo has built in UV tools and the main one used here was 'Project from View'. It's not for a game engine, not at 980,000+ polys and counting. heh. My textures are usually 3000x3000 pixels. Ah, good to know. I'll check Modo out since I see a trial version is available. I've been using a simple and free version of UVMapper. Tiny pocket sized unwrapper with simple functionality in a 576kb exe file. Seems to do okay-ish. I understood it a lot better than Blender's native unwrapper, unfold3D, 3D-Coat, or some others I've tried. For high resolution work, 3k is kinda small actually. I'm going to output the textures for my Constitution at 8k and downsize as needed. And just use as many as you need to get the result you want. Of course, you need more memory to render all those textures. Especially if you are doing PBR. Also, always go for a power-of-2 texture size. Your videocard will upscale it internally to 4096x4096 anyway so it won't really matter for you renders, just gives you a little bit more detail to play with.